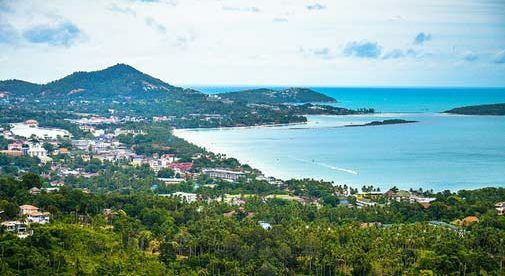 Lying about 425 miles south of the country's capital, Bangkok, Koh Samui has become one of the most coveted expat destinations in Thailand. “My little house in the middle of the jungle is serene and simple. I have mango and tamarind trees in my yard and more birds than I can count,” says expat Carol Kandell, 49, who’s lived full-time on the tropical island of Koh Samui, Thailand, for the past three years. Koh Samui boasts world-class beaches tucked away in secluded bays…expansive inland jungles teeming with exotic birds, butterflies, and monkeys…magnificent cascading waterfalls and inland natural pools…and an almost countless choice of great spots to sit down, relax, and watch the spectacular sunsets over the Gulf of Thailand. But here’s the thing. Even though Koh Samui offers so much tropical beauty and so many outdoor “adventure” activities like deep-sea fishing, scuba diving, horseback riding, archery, golf, tennis, jungle trekking, and more, it also has just about every modern amenity you could ever think of within minutes of your front door. You’ll find air-conditioned shopping centers…high-speed, fiberoptic internet…easy, affordable digital TV access…top-notch home improvement and consumer electronic stores…fully-stocked grocery stores with imported foods from all over the world…and modern, fully-equipped gyms. And since Koh Samui has a well-paved road that circles the island, it’s easy to get from place to place, no matter where you find yourself. Koh Samui features a tropical monsoon climate, so it’s sunny, warm, and humid most of the year. The weather is quite wet in October and November, though, so make sure to pack your waterproof jacket if you plan to come at that time of year. Cheap ponchos are also for sale in many stores and supermarkets for as little as 30 baht (60 cents). Count on average daily temperatures ranging from 78 F to 84 F throughout the year. It’s affordable to live in Koh Samui, too. You can find fully-furnished apartments for rent—even in highly popular tourist areas like Chaweng—for as little as $200 a month. A tasty, local-style khao man gai lunch (Thai steamed chicken and rice) and a bowl of Thai-style clear soup is $1.45. And a tank full of petrol for a standard motorbike is only $3.48. For $1,777 a month, an expat couple could live very well. And when it’s time to rest, relax and have a good time, Samui has more than enough going on to entertain even the most restless expat.